Tesla reports first-quarter earnings after the close on Wednesday, and Wall Street will be looking for updated plans on the Gigafactory, the company's fights with various states, and whether demand for the Model S is still as healthy as CEO Elon Musk and team claim it to be. Updated from 11"04 a.m. with thoughts from Bank of America Merrill Lync analyst. NEW YORK (TheStreet) -- Tesla Motors (TSLA - Get Report) reports first-quarter earnings after the close on Wednesday, and Wall Street will be looking to hear updated plans on the Gigafactory, the company's fights with various states, and whether demand for the Model S is still as healthy as CEO Elon Musk and team claim it to be. When Tesla reported fourth-quarter earnings, Tesla said it expected to deliver 35,000 Model S units in 2014, up 55% year over year. For the first quarter, Tesla expects to produce around 7,400 Model S units, but would only deliver 6,400 of them due to the high number of cars in transit to both Europe and Asia. The company noted that battery cell supply will continue to be a constraint in the first half of 2014, but that will "improve significantly in the second half of 2014." Furthermore, first-quarter gross margins should increase "very slightly" from the fourth quarter, but are expected to improve throughout the year. Non-GAAP gross margins during the quarter were 25.2%. 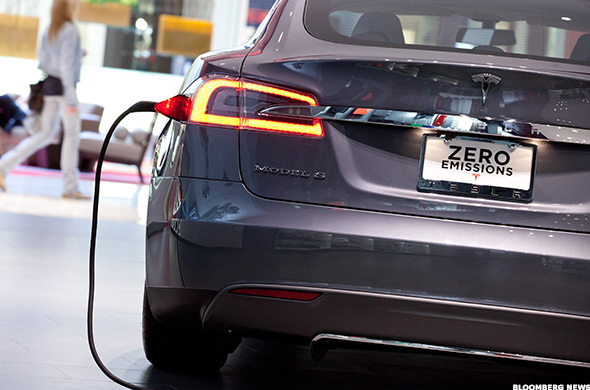 For the fourth quarter, Tesla earned 33 cents a share on $761 million in revenue as it delivered 6,892 Model S units. Analysts surveyed by Thomson Reuters are expecting Tesla to earn 10 cents a share in the first quarter on $699.09 million in revenue. In light of the company's recent battles with state legislatures, analysts are sure to question whether the company's direct sales model is sustainable over the long haul, or whether Musk and company will need to rethink their strategy in order to make the market for electric vehicles as large as they want. In April, Tesla was banned from selling directly in New Jersey, following a very public battle with N.J. Gov. Chris Christie (R.) and his administration. 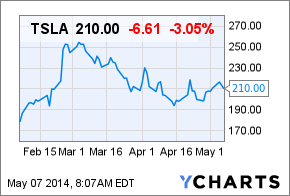 Shares of Tesla were down sharply in trading on Wednesday, falling 2.7% to $201.63. Tesla was able to avoid the same outcome in Ohio, where it can sell direct to consumers in its two stores in the state, one based in Easton and the other in Cincinnati. Not only can Tesla sell directly to consumers in its two existing stores but Tesla also is allowed to open a third store in Cleveland. As per the agreement, Tesla is the only automaker allowed to operate its own stores in the state. In addition to the company's problems with its sales model in the U.S., Tesla in February announced preliminary plans for the Gigafactory, which is designed to help cut lithium-ion battery costs and boost production to 500,000 cars per year by 2020. Palo Alto, Calif.-based Tesla noted that due to the Gigafactory, battery costs would come down more than 30% by 2017, when the mass market, Gen III vehicle is slated to appear. By 2020, not only is the Gigafactory expected to help produce 500,000 cars per year, but it's also going to be producing 35 gigawatts worth of cell production and 50 gigawatts worth of pack production. Following the February announcement of the Gigafactory and a $1.8 billion debt offering (Tesla sold more than originally planned), shares in Tesla have dropped considerably, falling from a high of $265, which showed that Musk and company have been adept at raising capital at the right time and striking while the iron is hot. Now it's up to the company to see how to best use that additional capital, as the company increases its presence in Europe, expands into Asia, and brings forth both the Model X (scheduled for later this year), and ultimately, the third-generation vehicle, which Musk has said he wants to get down into the $30,000-$40,000 price range, compared to nearly $70,000 for the Model S.
Analysts by and large were pretty positive going into the quarter. Here's what a few of them had to say. "We expect Tesla to report 1Q14 financial results and vehicle deliveries essentially in line to modestly ahead of investor expectations. We model NGrev/ adj-EPS of 684m/$0.08 versus consensus at $699m/$0.10. We expect Tesla to meet deliveries guidance of 6,400 units, with potential 1Q14 unit upside unlikely exceed more than 100-200 units. We model 1Q14 adjusted gross margins of 25.3%, compared to 24.9% in 4Q13, and 17.1% in 1Q13. We believe that if there was revenue or margin strength in the quarter it would likely from ASPs, where we model an ASP of $104k in 1Q14, compared to $106k in 4Q13 and $93k in 1Q13 (when Tesla was delivering a mix of 40kWh and 60kWh Model S vehicles)." "1Q results are a red herring. Resolving the battery partnership stand-still is key, in our view. If defined by how often a competitor's name is mentioned in the boardrooms and halls of the auto company C-suite, then we believe Tesla is the most important auto company in the world. This has at least as much to do with Tesla's vehicle engineering and connected car capability as it does with its electric powertrain. While the stock's valuation is clearly discounting selling far more cars than its 35k annual run-rate, we believe it is not discounting Tesla's potential as a truly disruptive force in a $2 trillion industry." "After declining below our $200 target, we think the risk/reward balance has become more favorable. Ahead of earnings today, we are positive on TSLA's fundamentals. We see rising in demand in N. America and abroad, including initial China sales. Still, despite entry into what we expect will be TSLA's largest market, near term capacity appears constrained. Although we see risks related to TSLA planned Gigafactory, we expect key supplier Panasonic will participate. We believe that as a unique player and growth company, TSLA warrants a premium valuation to auto manufacturers." "Tesla has also done a good job in managing 1Q volume expectations by creating a substantial cushion in its delivery forecasts. Specifically, the company is forecasting 7,400 units of Model S production in the quarter, but only anticipates delivering 6,400 units, with the delta explained by vehicles in transit to Europe and China. We believe Tesla set the bar very low in 1Q, partly due to slowing North American demand and what appears to be lackluster interest in most Western European countries, including the very important German market."